FILE - European Trade Commissioner Cecilia Malmstrom attends an interview with Reuters in Geneva, Switzerland, June 4, 2018. The European Union and United States have not yet agreed on the scope of trade negotiations, but the bloc will not include agriculture in the talks, its trade commissioner said on Wednesday. Cecilia Malmström told reporters the EU was willing to include all industrial goods, such as autos, in the discussions. "We have made very clear agriculture will not be included," she said, though the two sides had not yet agreed on that issue. 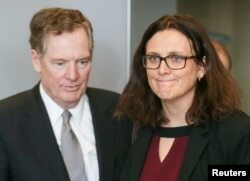 FILE: U.S. Trade Representative Robert Lighthizer and European Trade Commissioner Cecilia Malmstrom take part in a meeting, Brussels, Belgium, March 10, 2018. She was speaking after meeting with U.S. Trade Representative Robert Lighthizer and ahead of a meeting with U.S. and Japanese leaders to discuss World Trade Organization (WTO) reform this week. U.S. President Donald Trump has demanded better terms of trade for the United States from China, the EU and Japan, saying poor trade deals cost the United States millions of jobs. Washington has already reworked the North American trade treaty with neighbors Mexico and Canada. USTR notified lawmakers in October of its plans to pursue the trade talks with the European Union. American farmers and farm state lawmakers such as Republican Senator Chuck Grassley from Iowa have said they want agricultural products to be included in any new trade deal. Malmström said she had received no assurance that a U.S. auto tariffs report would be put on hold during the discussions, but believed the European bloc would not be affected by such tariffs while the talks were ongoing. The EU was in the final stages of preparing its negotiating mandates for the talks, she said. The mandates would first need to be cleared by the commissioners before being presented to the EU's 28 member countries for approval. It was unclear how long this process would take place and when formal talks could be held. Experts from both sides will conduct discussions about technical matters this week. Discussions around the reform of WTO rules have focused on transparency and ways to address concerns over Chinese trade practices. "We are not forming a coalition against China. We are worried about many of the Chinese practices," she said.